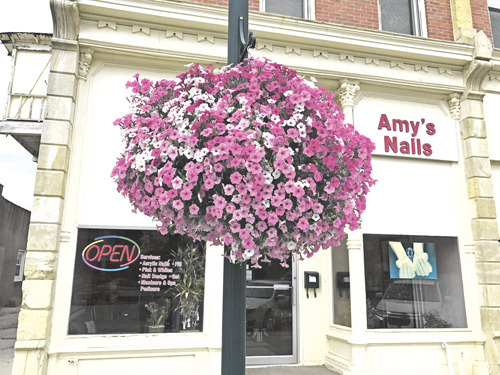 Step along the streets of Winterset, Iowa, and many people will notice the beautiful hanging baskets of pink petunias along the sidewalks coloring the haze of a bright spring day. The hanging baskets are the product of Groth’s Gardens and Greenhouses, a Winterset gardening business owned by the Groths. “People come to Winterset to see the baskets or take pictures or things like that,” Deb Groth said. She attributes the steady traffic that sustains the town’s shopping district and her garden business to the efforts of the Madison County Chamber of Commerce, of which the Groths are members. “Madison County with all our bridges … has done a remarkable job of marketing the area. In Winterset, it is the tourists that keep the small shops open. The town is not big enough for just locals to sustain all our businesses,” Groth said. 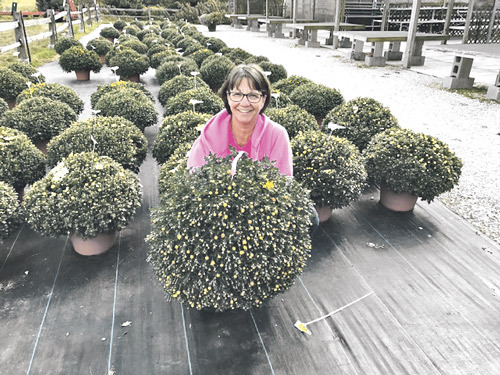 Starting in 1993, selling 500 mums, Groth’s Gardens and Greenhouses grew over the years, adding roses, shrubs and perennials – whatever the market demanded – until they settled for growing annuals in the spring and selling mums in autumn. Groth’s opening day is April 12, which Groth said is too early. “People just really push for what we are selling but you really shouldn’t be putting annuals out when it is that early,” she said. Groth was trained as a teacher, but settled in at home to raise a family. That is when an idea spawned in her mind. “In 1993, at the dentist’s I read about a farm where they put their daughters through college by raising mums. I said we would give that a shot and our Extension director was very helpful. And we put up the 500 mums,” Groth said. She doubled the number of mums each year for the next two to three years. “We started to plant perennials when they were just getting hot in the late 1980s and 1990s. We looked into it and found it was a different concept because they had to grow in a greenhouse,” she said. Local experts said to throw all advertising to Des Moines, which Groth said was not a lot at the time. Groth’s is a seasonal business dependent on the weather and seasonal help to sustain the business, growing and selling mums, pansies and annuals. She said the annuals take the biggest share of the business. Groth said the trick to running a successful garden business is to stay one or two steps ahead of the box stores. “We are 25 minutes from Des Moines. What we are is a niche business,” she said. Groth’s Garden and Greenhouses has an e-newsletter, and Groth said their Facebook page does really well. “We do an advertisement in the Des Moines Register about every other Sunday. It’s smaller businesses that advertise there that are drivable destination-type businesses,” she said. “We market ourselves as a destination. After 25 years in the business of growing and selling mums, pansies and annuals, the Groths have finally settled on their success as a niche business. “It appears to me that we will continue with our annuals, the hanging baskets and mixed containers,” Groth said.